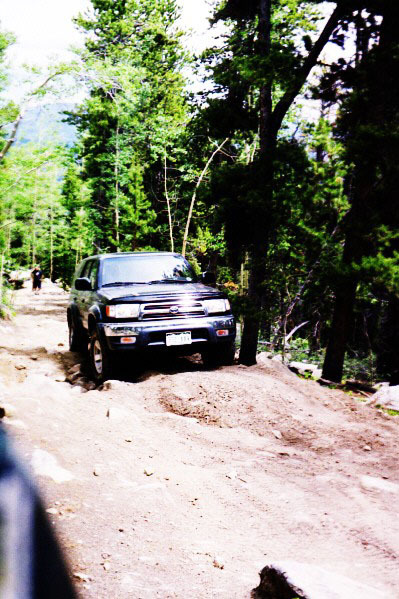 It was a month and a half after Cruise Moab 2000, and my friend Scott wanted to go play in his 2000 4Runner. I called a couple other buddies, but he was the only one who was able to make it. 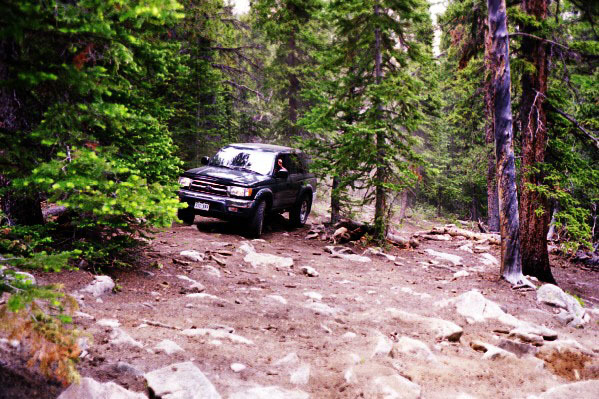 Ann and I had tried this trail on Mother's day, and we only got partway up, as wheelers who were headed back down were reporting deep snow up high, and that it was impassable without a winch and lockers. 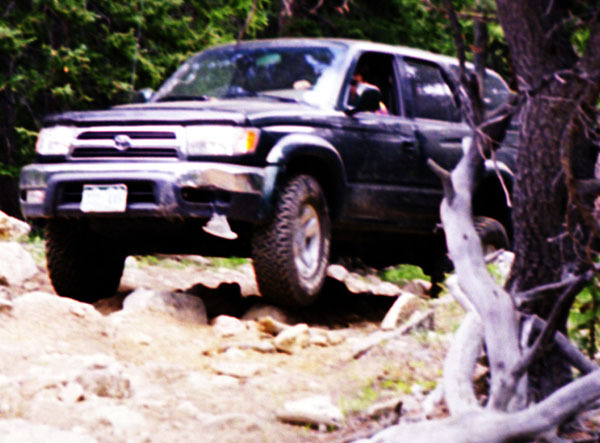 We did end up playing around in some old mine tailings piles, and discovered a wealth of different side trails in the area. 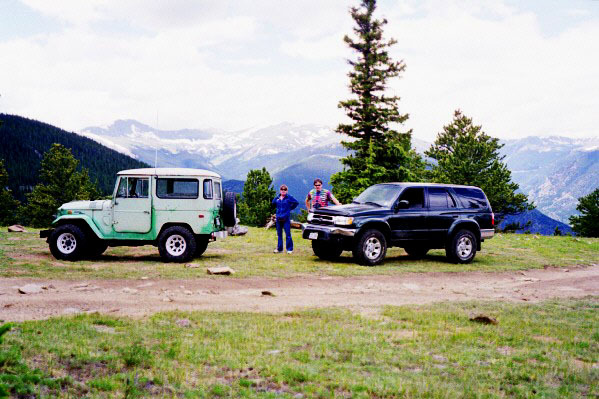 Since it is only a short drive from town to the trailhead, it is an attractive trail. 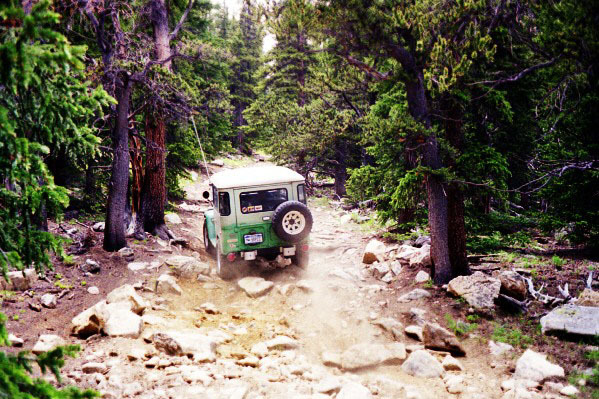 Adopted and maintained by the Mile High Jeep club, they give it an 8 out of 10 rating, with ten being the most difficult. CoSports rates it a double diamond, also one of the most difficult ratings. So on the Sunday after Father's Day we set out to see what all the fuss was about. We weren't disappointed! 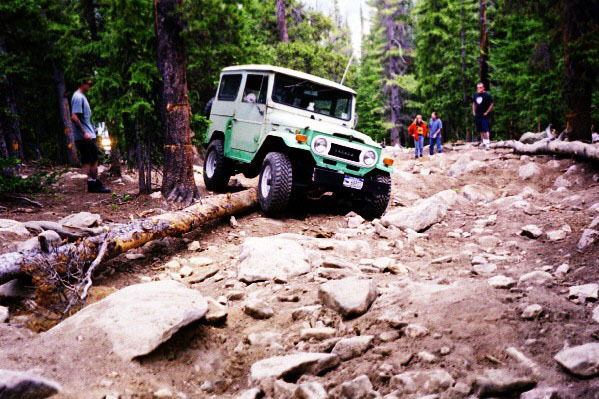 The first real test is a rock ledge that looks fairly tough. It is. 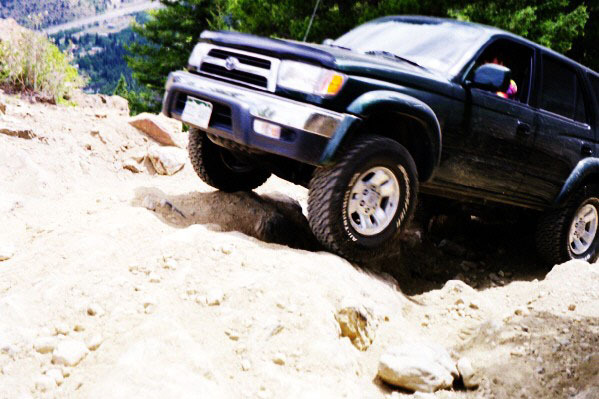 Here is Scott's 'runner clambering up. Take a good look at this view of his front bumper. This is the "before" shot! 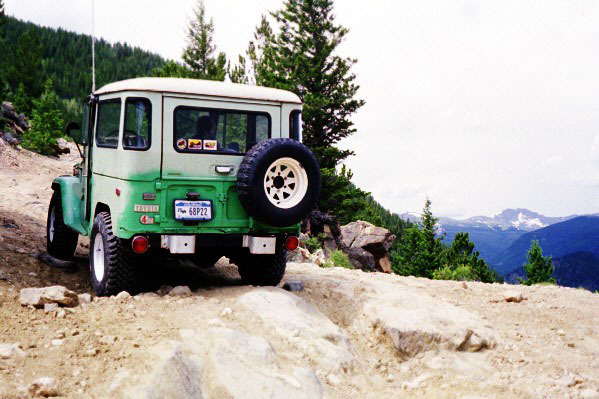 From the same spot, I swung around and took a shot of my '71 FJ40 with the snowcapped rockies in the background. At the base of the start of the really challenging section, I parked and took a photo of Scott approaching it. 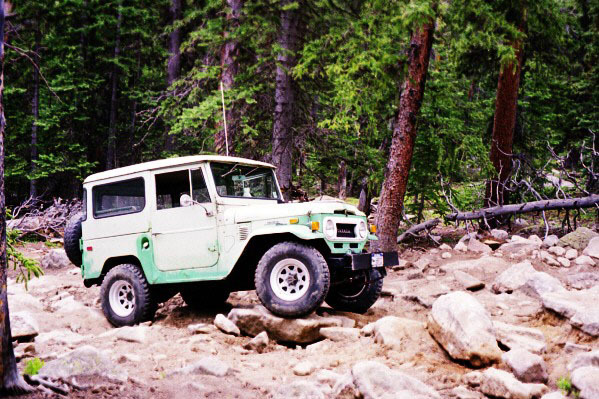 "IT" is a steep boulder field, with deep holes between the rocks. At this juncture, I walked up it a ways to spot my planned line. There is a bypass, but I decided to give the rough section a go. I set out on my serpentine line, zigging and zagging between the larger boulders trying to keep moving forward. By this time a number of others who came up to wheel stopped to watch my progress. 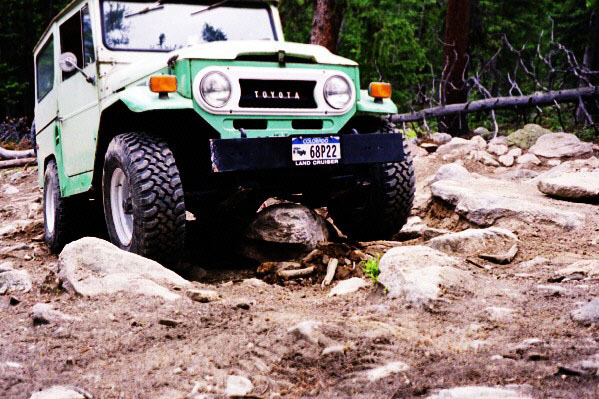 Bear in mind I am driving a totally stock 29 year old Land Cruiser with 31" tires. 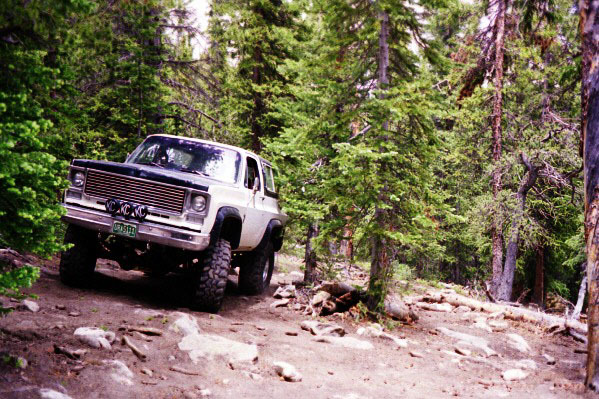 When I say stock, I mean stock: open diffs, factory 29 year old springs and shocks, and stock 29:1 "crawl" ratio. After zigging now I zag. So far so good. Well, here I am high centered. That rock that is under my diff and u-bolt plate was under my tire. 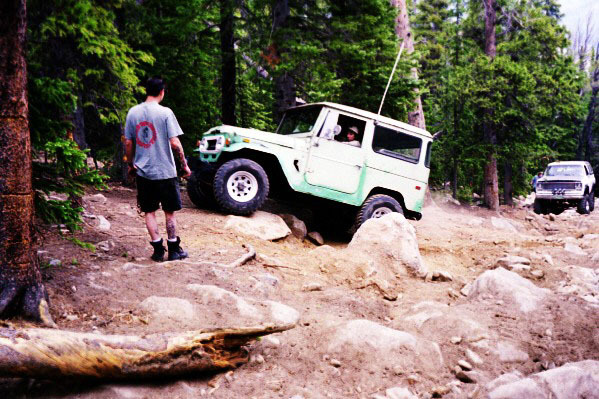 I had planned to drag my rear diff across one rock while I crawled over another with my left front tire. Unfortunately, the one under my front tire rolled underneath my front axle. Out came the HiLift and I was on my way. Unstuck, ready to try again. This time I made it using a different line; the rocks were rearranged by my earlier attempt at passage. Photos simply do not do justice to how difficult this section of the trail is. Scott sneaks between the trees through the bypass. Even though it was a "bypass", it was no walk in the park. This was a very steep, rocky trail. Scott and his 'runner are looking good. This guy in the blazer had 38" swampers, spring over, 3" body lift and a lincoln locker in the rear, yet he still took the bypass. This is the "after" shot of Scott's bumper. Note the running light hanging by the wire harness and the good sized dent in the bumper. 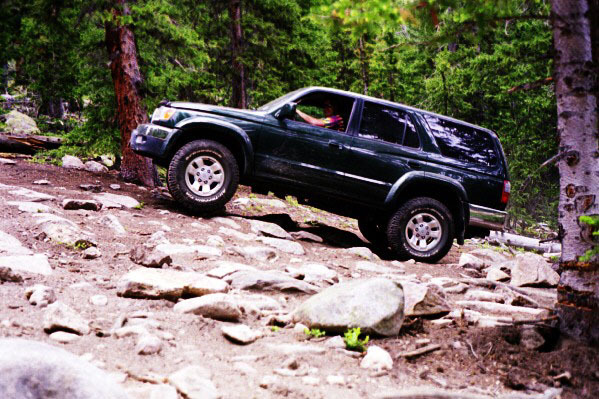 Reportedly, he was trying to avoid a rock and ended up hitting a tree. I told him that this was a great opportunity to lose that POS stock, DOT-approved crumple zone excuse for a bumper and get a real bull bar. 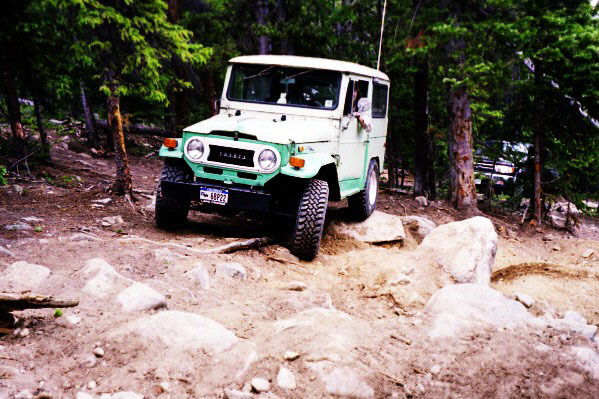 He is going to get an ARB. 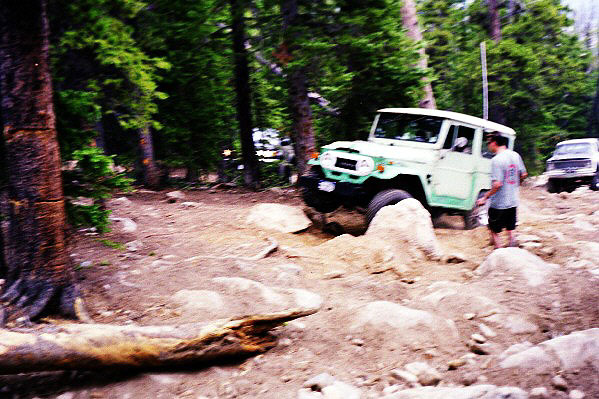 Even after the rock garden things didn't let up. This trail was steep and rocky. I mean really steep, really rocky! Finally at the top, we stop to enjoy lunch and some spectacular views. The trail down to Georgetown was very easy.